← Three Squares or Four? A recent aberration in the weather caused all sorts of havoc in the giant metropolis known around here as The Metroplex. (That’s Dallas, Fort Worth and all the little ‘burbs, both the swallowed up and the stubbornly semi-independent.) Late in the season, we had ice, freezing rain, sleet and then, to add insult, five inches of snow. Because North Texas rarely gets such weather, we are never really prepared to deal with it. So, schools closed, some businesses closed, churches cancelled meetings and people stayed home. Those who did not or could not hibernate, paid the price by sitting in traffic for three to five hours, hopefully with a full tank of gas. Friday morning, quite early, we had mail and I assumed we were back on schedule. Saturday there was none. I actually looked on Sunday to see if per chance the drivers worked to make up the snow days. No mail again on Monday! Now my Netflix disk was overdue and I was waiting on papers from our tax accountant, so I was getting steamed up about this. Just before calling to rant on Tuesday morning, I checked the box to find it bulging at the seams. When I vented to a friend who lives in snow country, she remarked that I wasn’t usually prone to be so “judgmental.” This set me back a bit and I chewed on the subject a little more than I might have otherwise. I don’t think it was the unexpected snow days that ticked me off, so much as the culmination of years of disappointment with how things are going at the United States Postal Service. I am old enough to remember when the rate for a first class letter was four cents*** and a penny less if you didn’t seal the envelope. The postman actually walked from house to house putting mail in a box hanging conveniently near your front door. You knew his name and marital status and offered him a cool drink on hot days. His job wasn’t hard but it wasn’t easy and he was paid a decent wage. Postal workers were paid more than they were worth, so much so that the civil service exam had a waiting list of people wanting to get on the gravy train. They soon had a month of paid vacation, free doctor visits and fantastic retirement plans. They also had a union that virtually guaranteed a job for life no matter how lazy, unfit or negligent, as long as they didn’t get caught stealing checks from the mail. Employees who did lose their jobs were known to go crazy and start shooting people. Today stamps are almost fifty cents, we all walk to the street to collect our mail and the postman won’t even wave. If you take a package to the post office, you’ll get the third degree about what’s inside and if it’s liquid or contains a battery… Let’s just say there are so many rules the postal workers can’t agree on what to do anymore. They have an online service, which I find to be quite convenient and avoids having to observe gross inefficiency at the counter. However, in my experience, there is only a 50% chance my package will be picked up. A few weeks ago I received a letter for the former owner of my house. It was from a government entity, so I wrote her new address on the envelope, headed it up with “Please forward” and put it back in the box. The mail carrier crammed my new mail on top of it. Twice. So I took the letter to the nearest post office. “We deliver mail; we don’t pick it up,” she said with a sneer, and advised me to take it to the post office that serves my zip code. I put it in her outside box. I don’t know but what the whole thing with the post office is my personal problem. I moved here from a small town where things were different. Five years after we closed our small business, we still got mail addressed there. The postman always waved and smiled. The dog barked at the mail truck because he knew chances were good the mail carrier would pitch a treat over the fence. And in seventeen years, they never failed to deliver the mail because of snow. This entry was posted in Short Takes on Life and tagged attitude, complaining, ineptitude, Obamacare, post office rant, snow days. Bookmark the permalink. 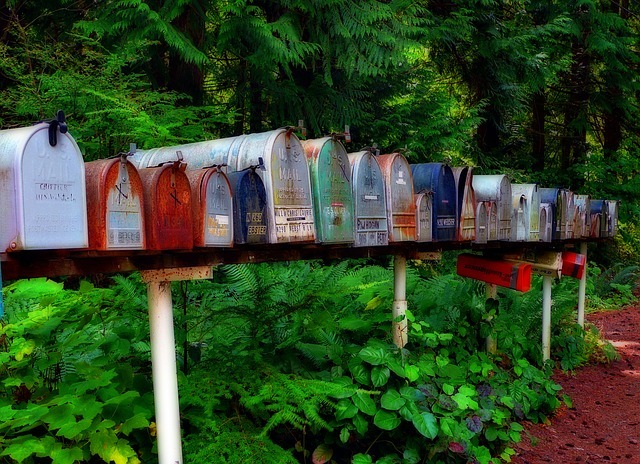 6 Responses to Where Is the Mail? For that one, I won’t complain. I truly sympathize with mail carriers dealing with unrestrained pets. They will sometimes bite the postman when they’ve never shown aggressiveness toward anyone else. I guess they never had a friendly mail carrier that pitched treats over the fence! With our Netflix discs we just keep ’em as long as we want; they are never overdue – we just can’t get a new one until we return the old one. It was good to hear from you. I’m in that former small town. The postman brings any packages larger than my street-side box up on the porch, when I’m out when he runs, he waves. During the recent wicked weather, the courthouse and schools and most businesses were closed, the (next door, larger city) newspaper didn’t get delivered, but the mail ran.